The Trinity Amps Tweed Amp is based on the original Fender 5E3 Tweed Deluxe. For rock, country or blues players who want a moderately powered amp they can crank up on a small to medium sized gig or in the studio, the Trinity Amps Tweed may be the amp for you. The fat, snappy guitar tones heard on many recordings, from Memphis to Abbey Road, were made using the Tweed. This is not a Marshall Les Paul EL84 sound, but it is familiar if you’ve heard anything recorded in the 60’s or 70’s. The Tweed produces about 15 loud watts into 8 Ohms using two 6V6 output tubes and is housed in a classic Tweed cabinet. The circuit is based on the original Fender 5E3 Tweed Deluxe. To develop our version of this famous amp, we improved the layout, grounding, isolated the input jacks and therefore reduced noise level. We then had Heyboer make us custom transformers, again to our specifications. The Power Transformer is improved as well with high current capacity and a ground wire for the heaters to reduce noise. The OT is the Fender #108 design with heavier gauge wire for reliability, 8 and 4 ohm speaker support and again we used old grade steel to our spec. The redesign also includes a standby switch which is a useful departure from the original. What differentiates our kits from others is part quality, fit, documentation and support. This is a full kit with custom Heyboer transformers, tubes and vintage chrome chassis printed on both front and rear. We supply quality parts. Switchcraft Jacks; Carling Switches; Belton tube sockets; Carbon Comp resistors; Orange drop type capacitors; 22 gauge General cable hook-up wire; pre-twisted heater wire; Belden coax cable; Tube complement is: JJ 6V6, 12AX7; EH 12AY7 and JJ 5Y3; Thick 1/8″ GP03 eyelet board material, not the thinner eyelet board stuff. The chrome stainless-steel chassis with printed white lettering on front and rear looks pretty well stock from the outside but it’s built old school and looks and sounds vintage Deluxe! Also included is our custom built Heyboer transformer set. The Power Transformer is a High Current design and the OT is a beefy Fender #108 design with 8 AND 4 ohm speaker taps. We provide 65 + pages of quality full documentation and support and large format 11X17 schematic and colour layout. Most companies charge extra for Switchcraft Jacks, Carling Switches, Carbon Composition resistors and some only provide minimum documentation. Compare us to the other kits out there and you’ll find this offering is a great value. 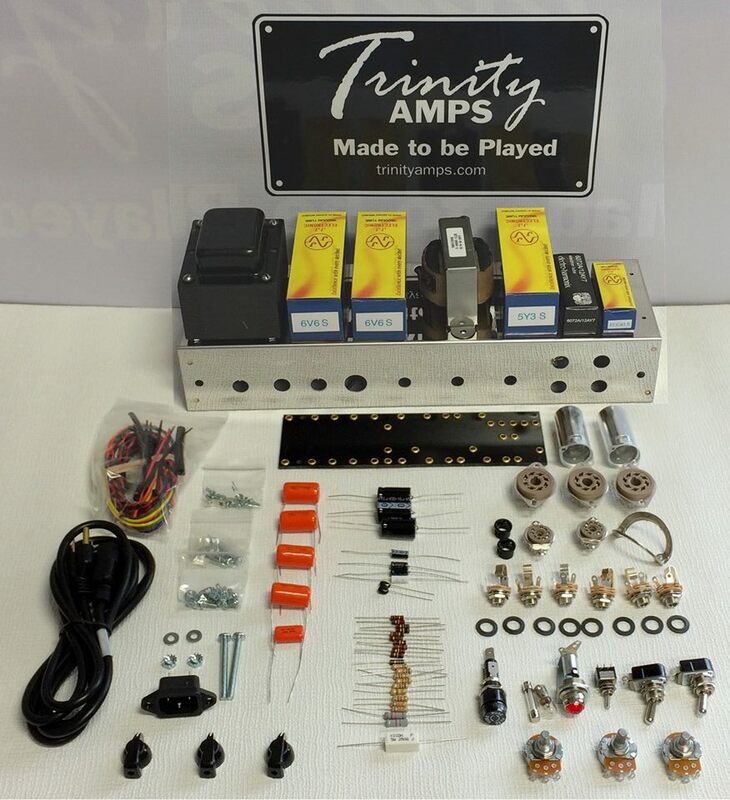 I was recently asked by a family member if I could assemble a Tweed amp kit from Trinity Amplifiers. 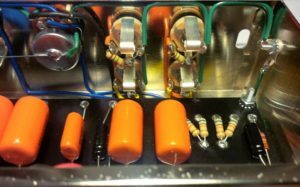 I love old Fender amps and like to see how various vendors put together their interpretation of the legendary 5E3 Deluxe circuit. I’ve built many kits for people and done a lot of my own amps, so this was an easy question to answer. Not long after accepting the job I was asked by Trinity if I would document my experience in building their kit. This document covers the whole thing. The kit arrived quite quickly, within a week. I opened up the surprisingly small package and found everything nicely packed and well organized. The first thing I did was to lay out all the packages and do an inventory. Before I get too far into it, I should say that this kit came with an extensive set of documents that covered the entire build process from beginning to end. In fact, my usual practice of laying out all the parts was right there in the step-by-step instructions. This is a very important part of the build. You get to see all the parts and determine if anything is missing. I was very impressed that they had bundled all the like components together. Hardware, capacitors, wire, resistors, each in its own package and easy to identify. Very early in the documentation they give you a list of all the major steps in the build so you have a road map to follow as you go. Each step has the detailed instructions required to complete that step. Very nicely done, particularly if you’re new to building and really don’t know where to begin. The order of operations is actually quite important if you want the best chance of success. One other thing I should mention is that in addition to the build instructions there is a lot of useful reference material available. There’s amplifier theory, tube charts, resistor codes and all sorts of stuff that will make you a better amp builder. I’ve never seen a kit with this level of documentation. Most vendors give you all the parts and a picture of the layout for wiring. After that, you’re on your own. I guess it’s a liability issue but I figure the more information you get, the less likely you will be to even think about liability. The chassis, switches, sockets and pots are all excellent. Most vendors have gone from chrome plated steel to polished stainless steel and the Trinity tweed kit uses this material. The finish on the chassis is amazing and rivals anything out there. Trinity was very smart with the chassis design. Everything fit perfectly and as a bonus, all the chassis holes used to mount the sockets were threaded. That’s a huge saving in terms of time and frustration. I followed the instructions and everything went smoothly. The sockets are really nice Micalex units from Belton. Access to the socket pins is clear and they are well away from the chassis, making the chassis wiring very easy. You can see the clearance available in this picture. Although this may not seem significant, experienced builders will appreciate it and newcomers won’t know how good they have it. All the other chassis components were excellent. The switches are Carling and the pots are from Alpha. To complete the hardware installation you’ll need a Phillips screw driver, a small adjustable wrench and/or a nut driver with a half inch socket. Here’s my chassis with all the hardware installed. Normally the transformers wouldn’t be installed yet but the kit arrived with them installed and I saw no reason to remove them. At this point I’m ready to do the chassis wiring. To make it easier I suggest putting the chassis on a couple of blocks to make it easier to wire and to protect the socket shields and retainers from accidental damage. Once the chassis hardware is installed you want to install the transformers and do all the in-chassis wiring. This consists of wiring in the power transformer and switches plus the 5 volt and 6.3 volt heater supplies and input jacks. To do this step you’ll need wire cutters, wire strippers, small needle nose pliers, 60/40 solder and a soldering iron. There’s more than enough wire included in the kit and the 6.3 volt heater wire is color coded and pre-twisted. Thank you Trinity. You’ll want to move from left to right, working across the chassis. Pay careful attention to the instructions and the layout diagram. Be sure to get the wire pairs correct for the AC leads on the power transformer primary. All the wiring you do at this point carries AC voltage from 5 to 600 volts. Keep the wire runs short and tidy and be sure to carefully twist all the wire pairs to reduce hum. I start with the incoming AC lines, then the rectifier, pilot light and heater wiring. After you complete this process you should wire the input jacks and the volume and tone controls. You can also add anything mounted to the sockets. When you do the input jacks take your time. Because they use a star grounding system there are extra ground leads running to the grounding points at each end of the chassis. When you’ve finished it should look something like this. Leaving the flying leads from the input jacks will make it much easier to connect them to the board once it’s installed. I also used a piece of tape to hold the coaxial lead in place. Now it’s time to prep the board for installation. What’s Different from a Vintage Unit? By the time you reach this point in the build, the biggest changes from a vintage amp are apparent. In the old amps they had a very thin brass plate that ran along the top of the chassis, right under the controls and input jacks. This version of the 5E3 doesn’t use it. The purpose of that plate was to provide a common ground point for the controls, jacks and related components. Trinity has gone a completely different direction. They have used a star grounding system that creates 2 chassis ground points. One on the left for the power supply and one on the right for the inputs and controls. In addition, the input jacks use insulating washers to isolate them from the chassis. The purpose is to prevent ground loops that could cause hum. This makes for some extra wiring particularly at the input jacks. You can clearly see the extra, green, ground wires running to the ground point on the right, and across to the controls on the left. Steel is not the best conductor. Back in the day chassis were Chrome plated carbon steel. Before a steel chassis is chrome plated it’s either Copper or Nickel plated to make the Chrome stick. The chassis was used as a ground plane. Chrome plating is a thing of the past today. Now it’s polished Stainless steel. Stainless is not a great conductor and very poor to use as a ground plane. The solution is to run all the grounds to one points and physically attach them to the chassis without any other ground points in the circuit. This kit is the 5E3 evolved. These changes will give you an amp with virtually no hum. The board provided in the kit is extra think with deep eyelets. You’ll need the same tools as you used for the chassis wiring. This is where you’ll find a change from the vintage 5E3 layout. Trinity has repositioned the phase invertor components to a location between the coupling caps for the output tubes. Electrically the connections are the same but relocating these components moves them away from the power supply and potential noise. All the components for the board are good. As a bonus, you get carbon comp resistors for all the critical signal path locations. Many people swear that these old style resistors are required to get genuine tweed tone. I don’t know, but they look good and usually you have to pay a premium to get them. Once again I install all the board components moving left to right across the board. Start with the power supply caps and move across. I like to install the components with the leads going completely through the eyelets before initial soldering. The resistors don’t have to be oriented any particular way. I like to orient them all in the same direction just for looks. The polypropylene caps (the orange ones) are not polarized so orientation doesn’t really matter. You may read that there’s actually an out foil layer connected to one of the leads. While this is true, the labelling on most of these caps is random from the factory and depends on which way they went through the labelling machine. The only parts you really need to be concerned with are the electrolytic caps used in the power supply and for cathode bypass on the pre amp tubes. Take your time. Be neat and follow the instructions. You’ll notice that I’ve connected the flying leads in accordance with the instructions. The back of the panel has running leads to connect the power supply nodes, star ground wiring and the leads going to the tube input grids. You could wire these connections on the front but you get a cleaner build if they’re in the back. The routing of the yellow grid wires in the back can be improved if you use a piece of shrink tube that’s provided and a piece of tape. Have a look. At this point you’ll want to double check everything, touch up the solder joints and prepare to install the board into the chassis. This is the last major step in completing the amp. Taking extra time in wiring the chassis and wiring the board will make this last step easier to do. In the original Fender amp they used a similar board with a backer board that acted as an insulator. This sandwich was then bolted directly to the chassis with sheet metal screws. The Trinity kit goes a different way and uses 4 machine screws with insulated standoff’s to mount the board into threaded holes. In the instructions the 4 screws go through the top of the board, through the insulators and into the threaded holes. I had problems with this. Maybe my hands are too big but I just couldn’t get the board in without the insulators falling off. My solution was to thread the mounting screws through the back of the chassis and drop the insulators onto them. After that you set the board onto the standoffs and secure it in place with 4 small nuts. The nuts aren’t supplied with the kit but they’re readily available at Canadian Tire, Home Depot or a hardware store. Once the board is secure you begin to connect the flying leads. They shouldn’t be excessively long or so short that the leads are pulled tight. I like them to flow in gentle curves from the board to the sockets or controls. You want to take your time and be tidy so that the lead dress will be clean and quiet. It makes a difference in the inherent background noise your amp will produce. Keep the leads close to the chassis where possible and follow the instructions. Thanks to a generous amount of color coded wire you can use industry standard coding for the leads. The plates are orange, the grids are yellow and the cathodes are blue. On V2 the wire to the first triode grid is a piece of shielded cable so it’s black. The shield is connected back at the control pot so it’s not grounded at the socket. You strip the wire and trim the shielding back. Slip on a piece of shrink tubing to cover the edge of the shielding and connect just the center conductor to the tube pin. There are green wires that run off each end of the board for the star grounding points, one for the pre-amp and one for the power amp. You can see that there’s no interference with the potentially noisy heater wires. Once the board is installed and the leads connected you should double check every wire and every connection. Before you mount the chassis in the cabinet it’s a good idea to test the power supply. I actually test it 3 times during a build. The first time is after I wire the power transformer and sockets. I test for high voltage from the secondary of the transformer, the 5 volt supply to the rectifier socket and the 6.3 volt supply to the other tube heaters. After the board is installed I repeat those tests, install the rectifier and then test all the DC power lines running to the tube plates. Without any tubes all of these readings will be high compared to the values shown on the layout diagram. If everything is alive and there’s no issues then you can connect a load resistor to the output jack, install the tubes and perform a completed chassis voltage test. Here it is on my bench ready for final testing. If you’re doing this kind of work you should have at least one good multimeter for measuring voltages, checking resistor values and continuity. I found that the voltages indicated on the layout diagram were extremely close to what my finished chassis produced. The folks at Trinity really did their homework. The power transformer puts out really nice voltages as does the output transformer. The Heyboer transformer set is really good and usually it would be an upgrade as many kits come with Chinese transformers. Although it’s a completely separate topic, you should be sure to check the biasing of the output tubes. If your B+ voltage is significantly higher or lower than the specified value on the layout diagram there could be a problem with incorrect biasing and the output tube idle current. Even if the numbers are good I like to give the amp a burn in period and observe the output tubes in low light. If they’re running too hot you may see some hot spots on the power tube plates. This amp ships with JJ 6V6-S tubes. Those tubes can handle current and voltage that would kill many 6V6 tubes so it’s pretty fault tolerant. If you’ve never played an original the first thing you should know is that no two amps ever sound the same. There is no standard for 5E3 tone. There is however a vibe that they all share. It’s a very simple circuit that can go from clean and sparkly to raw and aggressive. There are other shared characteristics such as the interactive nature of the volume and tone controls that have become sort of legendary. This kit delivers all of it and the amp is very responsive to your instrument and playing style. A change from single coils to humbuckers will give you a whole new pallet of tone to work with. Trinity has captured the Tweed vibe and tone quite nicely. The improved circuit design makes this amp virtually noise free. If you hear hum, check your guitar or cable. So that’s it. My build went very well thanks to a kit that was well designed and provided with top quality parts. The documentation, be it hard copy or online, is excellent. I can’t stress enough that you should read it all before you start building. Everything you need to know is there. If you take your time and follow the directions you should be able to make an amp that rivals anything commercially available at this time. You’ll learn a lot about amps and save yourself a lot of money. My dad gave me your Trinity Deluxe amplifier kit for my 14th birthday. Although I am a student guitarist, my father always made sure that I had good instruments to play. What I did not have, was an amplifier worthy of the quality of my guitars. I opened your kit, compared the parts with the parts list, laid out the parts on a large table covered with cardboard, and read the instructions. The instructions are so clear that even a child could build the kit. I guess that I am still a child, so my ability to build a Trinity Amplifier qualifies as a great example of the clarity and quality of your instructions. My dad and I agreed that I would work on it a couple of hours every Saturday night, and after practicing cutting, stripping, and soldering twisted wires together, I began to build the kit. 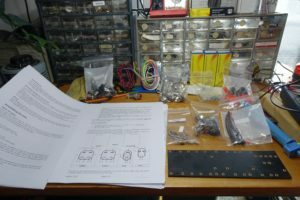 I read the instructions twice before I began to assemble the amplifier. They are very clearly written and illustrated with color drawings and photographs that make the assembly easy for anyone who doesn’t know anything about electronics… like me. My dad said to think of the assembly like weaving layers of thread to make a fine fabric. The sequence matters so I followed the instructions exactly and checked them off with a pencil. And in a very short time, my amplifier was finished. As I completed every step, I checked that the step was complete, checked my own work for correctness, and that the correct part was in the right location and facing the right way. The photos, diagrams, descriptions and instructions were flawless and easy to follow, even for me. My dad was a big help whenever I needed something to be held while I soldered it, and he twisted the grounding screws tight for me. I was having a very hard time cutting, stripping, getting the bare wires in the little holes, and bending the wires on the little round tabs on the controls and jacks from inside of the front panel. When my dad held the wires in place so I could solder them, I burned his fingers (not so much fun), or melted the insulation from the wires which you can see on some of the wires that I didn’t replace. I thought, why fight to stuff the controls, jacks, and wires, and try to solder them from inside the metal frame when I can mount the controls upside down on the front of the metal frame and work on, and solder them where I have unlimited space? I covered the front of the metal frame with masking tape to not scratch it, and mounted the controls and jacks inside out and upside down by tightening the nuts with my fingers. Now I had the parts in the perfect place, in the perfect alignment, with perfect part spacing, and with all of the room I could ever need in which to work. I turned the frame upside down and now with the parts facing out towards me, I could take all of the time in the world to make perfectly neat wire lengths, easy and very neat wire connections, and beautiful solder joints. Best of all, my dad was able to hold all of the wires with his larger (notice I didn’t say fat…) fingers and I didn’t burn his fingers anymore with the soldering iron!!! The last step was to solder a bare wire across the back of the controls to keep them all in perfect alignment so that when I took the nuts off of the inside of the metal frame, the parts would stay aligned and not bend the other wires when I transferred the beautifully wired controls and jacks to the inside of the metal frame and remounted the nuts on the front. I then took the nuts off of the inside of the frame, removed all of the wired controls and jacks as a single assembly, transferred the assembly to the inside of the frame, took off the masking tape, and replaced and tightened the nuts on the outside of the frame with a pliers. I used the blade of a flat screwdriver to tuck the other wires down against the metal frame. Finally, I took the wire that kept the controls all in alignment during the transfer to the inside of the metal box, and soldered the other end to the metal tab where the other wires are soldered from the controls and jacks. You can see it if you zoom in on the picture on top and look at the top right of the image. 3) The green wire that held all of the controls in perfect alignment when I transferred the controls and jacks as an assembly to the inside of the metal box. On the black board, I found that if I coated the empty small metal rings with fresh solder from both sides of the board before I put the parts and wires in, that they held the parts and wires more tightly, and soldered much faster and better than without the fresh solder. When I finished, I turned on the amplifier and ohhhhhhhh, WHAT INCREDIBLE SOUND! I have to say that the amplifier is amazingly quiet. Dead quiet. But I don’t think that my alignment wire is making much difference. I brought my completed Trinity Amplifier to my guitar instructor and let him play his guitar through it. He was totally knocked out and insisted on comparing it one after the next with the sound of every other amplifier in the store. Nothing else, other than a brand new $3,000 Fender amplifier (just like it) came close, and mine had noticeably less background noise, and was much, much cleaner and more transparent in complex sustained chords than the original. He asked if he could buy it from me, and I told him that he could buy one just like it from you. I think the amplifier is exceptional because of Mr. Cohrs design, the incredible quality of the parts that he chose for us, and the original design of the Californian, Leo Fender, who inspired and continues to inspire us all. It is unbelievably 3 dimensional and organic with n order string harmonics and details I have never heard in any other amplifier reproduced well beyond human hearing. With your Tweed amplifier design, the amplifier disappears into the music. And quiet??? I’m letting the amplifier burn in for 40 hours or so to let the transformers cure and capacitors settle in but as of now, 35 hours in, there is zero noise until the bright channel volume is above 7 with the tone control on full clockwise… and then there is just some high frequency hiss. I have played it now for about forty or forty five hours, and I would swear that my 1959 Gibson Les Paul Junior with P-90 pickups is even better sounding today than when I first finished the amplifier. It is like the amplifier and the speaker are breaking in together so there is even greater detail and transparency in the sound than when I first played the amplifier. Thank You Mr. Cohrs for giving a young musician like me the chance to make such an incomparable quality amplifier. It means so much to me to have made it myself and that the music that it produces is a product of my own hands. And I am most thankful to have shared that wonderful life experience with my dad, who is very proud of me. A Trinity Amplifier kit is a perfect gift for a musician of any age, and if I can build it and thrill to enjoy it, ANYONE can build and enjoy it. Great design. Great components. Great Product! Weight: 112 Combo 25 lbs. Tweed kit includes tubes and all components except speaker and cabinet.